ΑΤΙ’s first line of production can be found in the heart of the fertile Plains of Thessaly. Its Agronomic Department has the distinct advantage not only of being able to supervise ATI product varieties, but also to monitor, intervene in and indicate the time-frame and methods to be used for the cultivation, harvesting and subsequent transport of the end products. Strict monitoring goes hand-in-hand with the ensuing high quality of the entire ATI product range. The cultivation of tomatoes is demanding and dependent on a number of factors. The secret to its success is a thorough knowledge of the factors affecting cultivation, in addition to a constructive collaboration between the factory’s agronomic department and tomato producers. In this way a methodical dissemination and implementation of cultivation knowledge can be attained. This knowledge has been acquired over years of experience and research, and results in what is called Integrated Management constituting the future not only of tomato cultivation but also with respect to all cultivations. Temperature is the most significant factor in the development and maturation of the plant while temperature requirements directly depend on the stage of development in question. During the seed germination stage, soil temperature must be between 18-24ºC, as lower temperatures result in delayed germination. Development is achieved in temperatures of between 19-26ºC. In general tomatoes can withstand temperatures as low as 10-12ºC and up to 38ºC, with the obvious resulting delays in cultivation and decreased productivity. Tomatoes can be cultivated in almost all soil types but the best yields are obtained in soils which are neutral or slightly acidic, as a good ΡΗ level functions as a catalyst for the soil’s increased intake of a variety of nutritious substances. Above and beyond the PH factor, correctly choosing a field for the cultivation of tomatoes involves the following factors as well: the amount of organic substances therein, the existence of a drainage infrastructure so as to prevent rainwater damage, and the avoidance of intensive and long-term tomato cultivation in the same field. Appropriate preparation of the soil constitutes a necessary starting point for plantation. This includes tillage and mulching of the soil, as well as a good flattening of soil if immediate sowing is to take place. These days, the simple varieties of days gone by have been replaced with hybrids characterized by higher and more varied yields, a greater degree of resistance to micro-organisms and growth conditions, high levels of germinability, homogenous coloration and the ability to be machine collected. Hybrid selection is made by the company in question so as to be used in the production of different products: e.g. one hybrid may be used for tomato paste while another is used for crushed tomatoes. Additionally, proper planning and smooth delivery of the product to the processing company must also be ensured. Current tomato cultivation methods include planting in double rows with 45 cm space between each row and 120 cm distance between each double row. According to the plant’s size the row can accommodate plants in distances starting at 50 cm for a population of approximately 2,800 plants per hectare to 35 cm which results in approximately 3,800 plants per hectare. Planted depth must be from 1.5 – 2cm from moisture level depth yet not too deep so as to be easily watered (in the case of artificial rain, seed depth must be as minimal as possible). Note: in the case of seed cultivation, the number of seeds must be double the number of plants desired. Recently, the use of ready plants has played a dominant role in cultivation installations. In this case, the producer must pay close attention in choosing the nursery that will provide him with properly prepared, healthy plants. Sowing depth depends on the size of the ball of soil holding the plant in question, as this must be fully covered. Light watering is required post plating so as to attain maximum transplantation success. Nitrogen: 20-25 units, unless the field has a nitrate concentration, in which case 18 units are used. Nitrogen assists in increased vegetation, leaf surface, and the number of blossoms to a great extent, while use is made from onset of foliage through to decolorization. Phosphorus: 20-25 units. Phosphorus properties include the capacity to boost development of a plant’s root system and help in the development of fruit, thus its application takes place in two stages: the 1st during main fertilization and the 2nd during fruit setting. Potassium: 25-30 units. Potassium helps in the improvement of the fruits’ organoleptic properties, such as coloring and Brix, and is used following fruit setting and more intensely at the onset of discoloration. Pesticides are utilized at a time period prior to the final harrowing, 3-6 days before transplantation. 100-130 grams of metolachlor per hectare and 200-250 grams of pentamethalin 33% per hectare (doses are decided upon depending on the field type) are considered to be an ideal pesticide combination for industrial tomatoes so as to avoid any problems in cultivation. Great care must be taken in the choice of appropriate pesticide, as a faulty combination can result in increased toxicity and subsequent destruction of the plants in question. We recommend simultaneous application of ground insecticide together with the pesticide, especially if cereal cultivation has preceded the tomato cultivation or if substantial moisture levels are present. Tomatoes, like most vegetables, must have dry leaves in order to avert infection by bacteria or fungi. Drip irrigation is recommended, with the exception being the first watering which takes place using a sprinkler irrigation system. An extremely important point is the planning of regular irrigation, particularly following fruit setting. Spraying using the appropriate fungicides is necessary for the PREVENTION of disease. One spray is usually necessary during the first stages of plant development (following the 2nd irrigation). The second comes following setting of the third tress. We do not spray during full blossoming. The third spray is carried out following blossoming, while the 4th takes place 15 days later. We pay great attention to the use of pesticides, which, in contrast to fungicides, are used only to suppress attacks. Preparations used must be approved by the Ministry of Agriculture for use in industrial tomato cultivation. Pesticide residue creates a variety of problems in product exports including decrease in quality, and subsequently in price, through to cancelation of contracts and bad press for our country on a global scale. 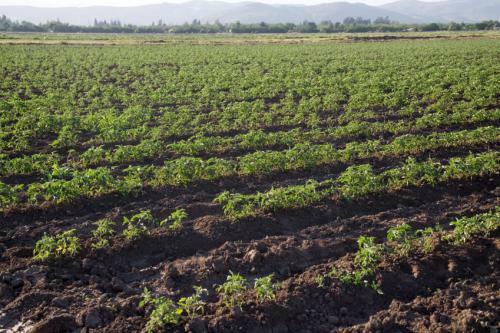 The fact that consumers nowadays demand a decrease in the use of herbicides and an increase in the use of organic cultivation, has led us to the cultivation of organic industrial tomatoes for he first time on a 100-hectare expanse in Greece. We trust that the initial results of these test trials will pique the interest of those involved in the field and lead to further such cultivations.